Eben Oliver Weiss, who has been blogging anonymously as The Bike Snob for the past three years, faced his fans Saturday afternoon at a signing in DUMBO for his newly released book, "Bike Snob: Systematically and Mercilessly Realigning the World of Cycling." He responded to some readers' professed "disappointment" upon learning his true identity as a former semi-professional racer, literary agent and now full-time writer ("What? You weren't expecting a whiny white guy?" he says), answered questions and showed a slide show of his early years of cycling as a child in Queens. While in his posts no one is safe from his good-humored ridicule, in person, Weiss proved to be a diplomatic, if slightly nervous ("I've never spoken in front of so many people before," he said to the thirty or so gathered) host, giving out Bike Snob-branded patch kits and T-shirts to those that had traveled the farthest (Finland) and anyone with a bicycle-themed tattoo (only one person was brave enough to bare it). His book, like his blog, takes a wry look at urban bike culture and the cycling world at large, but Weiss says that when he wrote the book he wanted it to be more than a collection of "vegetables that are shaped liked bicycle," presumably referring to the tendency that so many blog-to-books or "blooks" have to become. 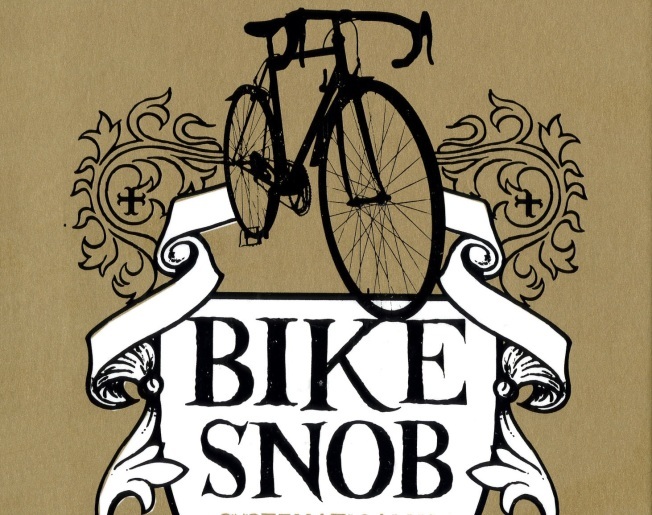 With chapters dedicated to the history of the bicycle and etiquette for non-cyclists as well as helpful tips on how to lock your bike and what to wear when you ride, Bike Snob can certainly stand on its own (also, it has stickers). But the most exciting part about writing the book for Weiss is that his readers have something they can take with them to the can: "And I hope you will," he says.